Recently, there has been a lot of chatter about fungal (or mold) infections in saline-filled breast implants. In fact, I have had a few patients from my Knoxville practice contact me with concerns regarding this. The fundamental question: Should you be worried about having a fungal infection or mold in your saline breast implants? For almost everyone the answer is a resounding “No!” However, if you asked whether this has ever happened, the answer is “yes.” To understand how this happened and the chances of it happening in the future requires both a review of recent history and a knowledge of how exactly saline implants are filled. Back in 2001, there was a cluster of fungal infections of saline-filled breast implants. Interestingly, I was asked to review the index case for this, so I have seen the original documents and can comment intelligently. These infections occurred in a single surgery center. Further, it was discovered that these infections occurred in a single operating room of that surgery center, and the risk of infection was greater if the operation took more time in that particular room. Understand how saline implants work. To get the significance of this, you need to understand something about saline breast implants. They are filled with sterile saline through a tube that is connected to a valve in the implant at the time of surgery, unlike silicone implants which are pre-filled and have no valve. Many years ago (as in over 25 years ago), the way this was done was by filling a syringe with saline that was in a sterile pitcher on the operative field, connect the syringe to the tube going into the implant, and fill the implant. This would be done multiple times until the implant was filled to the appropriate volume; then the tube would be removed. This became known as an “open bowl” technique. The closed technique for filling saline breast implants. 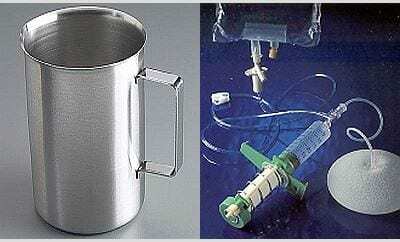 About 25 years ago, a new method of filling the saline implants was adopted. In this, sterile tubing is connected to an intravenous bag of saline (obviously sterile), and through this tubing the saline was drawn up into a syringe via a stopcock transferred into the implant by the tubed connected to the implant’s valve. This is known as a “closed” technique because the saline is never exposed to the outside environment. Sterile saline, sterile tubing, sterile implant — Do you see where I’m going with this? Fungal infections were caused by the open-bowl technique, which is now obsolete. Let’s go back to the surgery center where these cases were found. There was a major concern about what was causing these infections so a thorough investigation was conducted. They found that there was water damage to the ceiling of a storage area adjacent to the operating room where these cases occurred. This caused mold or fungus growth. This fungus got into the air and landed into the open pitcher (open bowl) of saline on the sterile operating field, and thus contaminated the saline that was being used to fill the implants. So basically, airborne fungus contaminated the saline used to fill the implants: contaminated air, contaminated saline, contaminated implants. It is currently considered the “best practice” (and I would go so far as to say the standard of care) to use the closed method for filling saline breast implants. Certainly most Board-certified plastic surgeons would agree with me — perhaps all of them. Even before these fungal infections happened in 2001, most of us had already switched to a closed technique. Before 2001 there had been a very few, isolated cases of the same fungal contamination of the saline. In response, the breast implant manufacturers produced the tubing necessary to allow a closed system of filling the implants. This was a very proactive move, which is typical of the major implant manufacturers: Allergan (Formerly McGhan) and Mentor. Should you be concerned about mold in saline breast implants? The overwhelming majority of women with saline implants have nothing to worry about. But, if you are considering saline implants, be sure to ask your surgeon whether he or she uses a closed technique to fill the implants. If this is the case, the risk of a fungal infection approaches zero. If you have had saline implants for many years, and you are concerned about your implants, the best thing to do is to contact your plastic surgeon and ask how the implants were filled. This fact should be recorded in the surgeon’s operative report. But the overwhelming likelihood is that there is no problem. If breast implants are not for you; all well and good. Don’t get them. But if you have, or are considering, breast implants, rest assured that they have been studied and scrutinized more than any implanted device, and they are safe and effective. Any concerns you have are best addressed with a Board-certified plastic surgeon. While there is plenty to look at online, I would caution you that not all of it is reliable. If you are like me, you will look at the science and base your concerns on this. If you need help with it, let me know.